TacNet is Rheinmetall's Tactical Management System TMS). It is designed to meet the requirements of high-mobility operations at the tactical level, essentially serving as a command and weapon engagement system. TacNet consists of a common software core. Moreover, it is modular in design. Specific characteristics are derived from a sort of tool box: TacNet Soldier for mobile operations conducted with mounted and dismounted troops; TacNet Vehicle for tactical vehicles; TacNet Command for mobile and stationary command posts; and TacNet Rotary for tactical helicopter providing close air support. Visitors to the Rheinmetall stand at AFCEA 2018 can familiarize themselves with TacNet Vehicle. 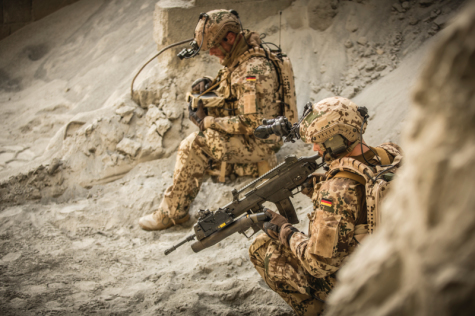 Presented for the first time at DSEI 2017, Rheinmetall is also showcasing its new Gladius 2.0 soldier system at AFCEA 2018. Gladius 2.0 is a systematic expansion based on experience gained in the German Future Soldier – Expanded System (IdZ-ES) project. The Basic variant is the standard version for infantry soldiers. It comes with a smartphone that serves as the command computer, enabling participation in network-enabled operations. The Advanced version encompasses an expanded array of capabilities for military leaders, including a second radio for communication with higher-echelon command elements. In particular, Gladius 2.0 is characterized by high scalability and flexibility. This means that other components can be easily connected to all variants on a plug-and-play basis. Augmenting the portfolio is the Light version, an extremely low-weight variant designed for special operators. Making its debut in 2017, PanoView is a new kind of visualization system that is especially well suited for use in armoured vehicles. It significantly improves situational awareness and command superiority. Based on cameras mounted on the vehicle exterior, this innovative concept transmits video in real time either to special goggles or to the main display. Innovative is the quality and speed of the image processing technology. In effect, the vehicle crew can see "through the armour". This lets them know what's going on outside the vehicle. Additionally, the tactical information about the situation is fed into PanoView by TacNet as command and control system. However, the information base can also be extended by integration of platform sensors, e. g. Laser Warning System (LWS) or Acoutusic Sniper Location System (ASLS).